• What’s new in the wound world? My co-presenter is Dr. Scott Bolhack who will give Part 2, presenting case examples from his extensive files. Dr. Bolhack is Clinical Assistant Professor at the Department of Medicine, University of Arizona and President and CEO. There will be fifteen minutes at the end reserved for audience questions. Webinar attendees are eligible for CME and CMD education credits. If you miss the live section, the webinar will be archived on the PA/LTC website. 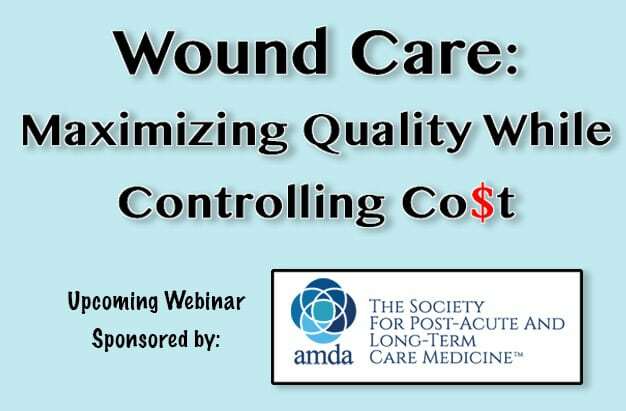 This webinar is FREE to members of the Society for PA/LTC. Non-member cost is $99.00. The content will include lots of material you cannot find in books and journals. This will be an information-packed session and I hope you will be on-line to participate! To register for this webinar please follow this link. Download my article in Caring for the Ages: Wound Care: What the Medical Director Needs to know.